Book Patrol‘s coverage of the Guardian‘s story dates back to July 2011, but because it is one of the most frequently viewed entries at Book Patrol and the artist has been frequently cited here, BOB cannot pass it up. “Last month, the book art piece above was found at the National Library of Scotland. It was the fourth piece found since March in a book-friendly location in Scotland. All references are devised from the work of Scottish mystery writer Ian Rankin and include a note professing some book love. First it was the Scottish Poetry Library where a ‘poetree’ was discovered on a bookshelf. 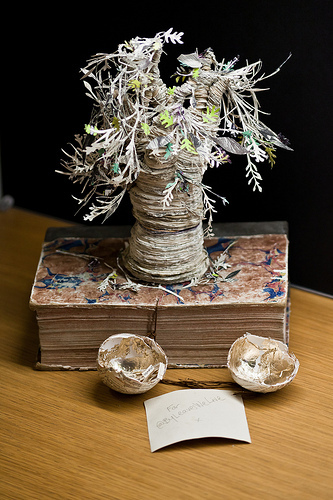 The ‘poetree,’ comprised of intricately cut pages, had a note attached referencing a Patrick Geddes quote and the library’s Twitter name,@byleaveswelive. and then one was found in the Robert Louis Stevenson room at the Scottish Storytelling Centre …” via Book Patrol: Banksy of the Book Art World.